Special Higher. Bigger. More solid. The LEGI fence systems are secure, offer versatile protection and can be expanded and enlarged in a variety of ways. 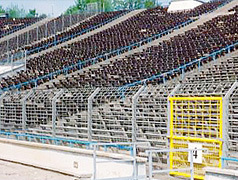 The special fences that we are presenting here are only a sample of what is possible with LEGI systems. With LEGI, you will achieve the ultimate in speciality areas: Extremely high, extremely solid and extremely secure. These special fences complete the range of effectiveness. 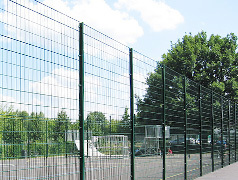 The LEGI ball catching fence protects residents living next to football areas, playgrounds and sports fields from the naturally unavoidable higher noise level from children and athletes playing ball. The system keeps the athletes from unwanted long interruptions in play caused by having to retrieve for the ball. The stone fence from the LEGI R system protects against observation and noise or sound from the outside and offers you a variety of design possibilities. The LEGI safety fences protect against destruction from impact, for example from vehicles, and against dismantling by intruders. Never have fences been safer and never have they offered more protection for people, property and buildings. 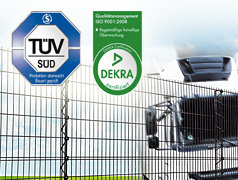 Only LEGI has TÜV and DEKRA-certified connections that make these exceptional accomplishments possible. Order is primarily established in our major sports facilities by a good separation between the athletes and the spectators. 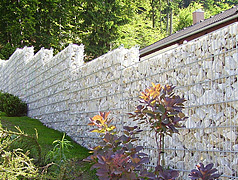 Stone fences are built from the LEGI R system in conjunction with special stone fence extensions. The stone filling provides them with an architectural character.